A Tonk's Tail... err, Tale...: "Fun Finds" Friday! This new series is a random list of fun & affordable pet-related stuff we thought you might like. 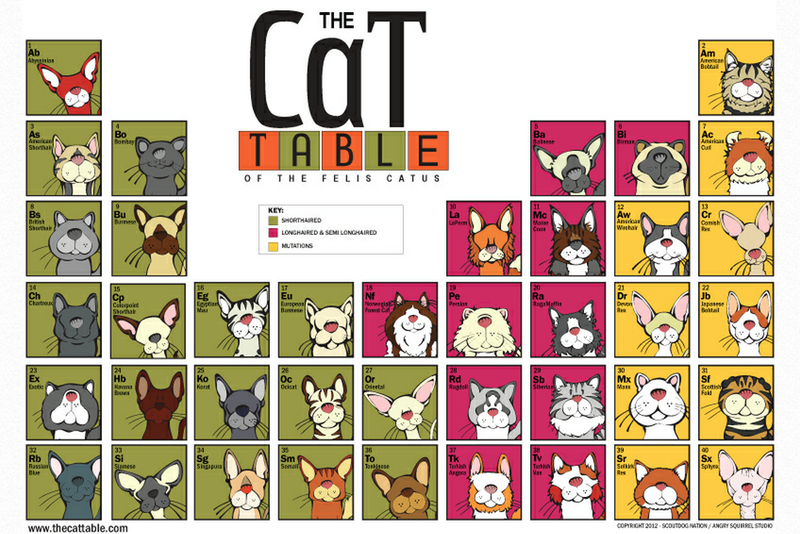 Today's Fun Find came to us by way of Parker & Maggie's human over at Kruse Kats, who shared this pawesome take on the Periodic Table. Anyone wanna get their geek on? You can purchase the poster for $12.50 at www.thecattable.com. We found ours, but they don't look as handsome as us. We agree! There's no substitution for the Real Thing! MOL! What fun. Have a fun packed Friday. FaRADaY: Just wait'll you see NEXT Friday's Fun Find. Almost makes us wish we had a doggie brofur! That is a cute poster. Gee, I recognize a lot of my friends on that poster AND see a ginger or two like me as well! I like it.....and can't wait to see your new header (although I do think the pictures of you guys and Allie are swell on the current header). So Allie's getting a glamour makeover huh? Hmm...now THAT's certainly worth tuning in for (hubba hubba). FaRADaY: *raises paw* We're represented, I swearz! Right in the middle, at the bottom! We like this poster! And we like this new feature! !